“We are quite pleased about the fact that [humanitarian assistance] was able to reach 82,000 people,” Special Envoy Staffan de Mistura told reporters following a conference call in Geneva with the International Syria Support Group (ISSG), comprising the Arab League, the European Union, the United Nations, and 17 countries. It was the second time since last week that Mr. de Mistura discussed with representatives of the ISSG humanitarian access issues. Despite aid being delivered to some besieged areas of Syria thanks to the cessation of hostilities agreement reached last week in Munich, it is only the “beginning of the task” assigned to the group, according to the envoy’s Special Advisor, Jan Egeland. “We discussed the next phase, which is to reach all of the remaining besieged areas of Syria and we should be able to do so before the next meeting, which will be in a week,” he informed the press in his capacity as co-chair of the task force on humanitarian access established by the ISSG. “We also hope by then to have progress in reaching the poor people inside of Deir ez-Zor, which is besieged by [the Islamic State of Iraq and the Levant, or ISIL/Da’esh]. That can only be done by air drops and the World Food Programme has now a concrete plan of doing so, many of the Member States support such operation, and it is probably one of the several cases in this sub-group where the coaches Russia and the United States have had an excellent cooperation,” Mr. Egeland continued. He added that the main goal is getting to “all of the millions in hard to reach areas,” including Aleppo, where the UN Office for the Coordination of Humanitarian Affairs (OCHA) today reported that intense fighting continues, including through aerial bombardments. Since the beginning of the month, it is estimated that some 70,000 people have been displaced in Aleppo, Idlib and Dar'a, due to the ongoing hostilities. “We hope that the Member States in the [ISSG] will continue helping us as they have on the government side, as well as on the opposition groups side so that we can make further progress in access to the people of Syria, which of course have waited too long for relief and which we have in many ways failed for too long as an international community,” the Special Advisor said. 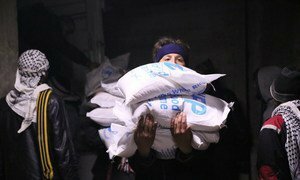 As United Nations relief wing convoys reached five besieged towns in Syria with aid today, the Office of the UN Special Envoy for the country announced that a task force will meet for a second time tomorrow to discuss humanitarian access issues.